This week, RIM announced the Blackberry Playbook – a sleek tablet with a 7 inch high resolution touchscreen, clearly designed to be a competitor to the Apple iPad. 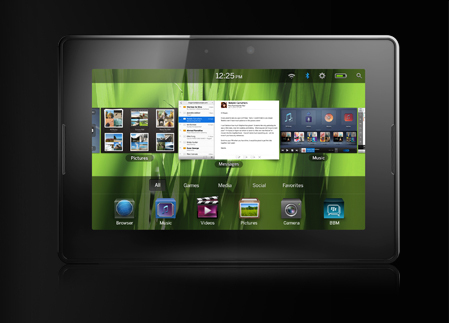 RIM purchased QNX and utilized their resources to produce the new Tablet OS that runs on the Playbook. This new OS looks very slick with, what appears to be, a rich easy-to-use interface. questionable app support – can ANYONE compete with the Apple AppStore? Blackberry is not Apple’s only competition. Android-based tablets are already available (see Samsung Galaxy), and HP is readying a Windows 7-based tablet called the Slate. And every single one of them wants to take the iPad down a few notches. What Apple always seems to have in it’s favor is a consistent user interface across it’s products (iPhone, iPod touch, iPad), and HUGE developer support through the AppStore. Do you have a tablet device already, or are you in the market for one? We’d love to hear what you think of the new Playbook and if it’s slick enough to sway you away from the iPad. Previous postWhere are my leads? Why would RIM omit a 3G transceiver? That makes NO sense at all.